DSC is, basically, a paging system that is used to automate distress alerts sent over terrestrial (i.e. : non-satellite) VHF, MF and HF marine radio systems. The DSC system's digital processing techniques, combined with the relatively narrow receiver bandwidths used, provide a DSC signal with resistance to noise and fading over the radio path. This results in increased range compared with radiotelephone transmissions. Unfortunately, DSC remains one of the GMDSS' least understood sub-systems. This lack of understanding is reflected in the very high DSC false alert rate. For those with a technical bent, the complete DSC technical specification, as published by the International Telecommunications Union (ITU). DSC is used to establish initial contact between stations. Following an alert by DSC, communications are normally carried out by radiotelephone or Narrow Band Direct Printing (NBDP - radio telex). DSC can be considered as a replacement for the radiotelephone and radiotelegraph (Morse) alarm signals. the nature of the distress. The ITU has allocated a DSC distress and safety channel in the MF, each of the HF and the VHF marine radio bands. Note that voice transmissions are PROHIBITED on the DSC channels. The MF/HF channels are restricted to distress, urgency and safety traffic only because of the relatively low speeds of transmission of 100 baud. If too many calls were permitted on the MF/HF channels, the channels would quickly become overloaded to the point where a distress call may be blocked. VHF DSC operates at 12 times the speed of MF/HF - accordingly, all priorities of call are allowed on the VHF channels. The ITU has also allocated a suite of HF channels dedicated to DSC commercial operations. These may be found in the ITU DSC operational specification (the link is at the bottom of this page). Distress alerts are automatically addressed to all stations. Urgency, safety and routine calls can be addressed to all stations, an individual station, or a group of stations. All DSC equipment is programmed with a unique nine digit identification number, known as a Maritime Mobile Service Identity (MMSI). The MMSI is sent automatically with each and every DSC transmission made. The first three digits of the MMSI are known as the Maritime Identification Digits (MID). The MID represents the country of registration of the vessel, or the country in which the DSC shore station is located. MID's are allocated on an international basis by the ITU, in much the same way as a callsign prefix. MMSI's allocated to merchant vessels are normally allocated with three trailing zero's. Those allocated to recreational craft have two or one trailing zero, and Coast Station MMSI's are formed with two leading zero's. The ITU operate an international web-based data base of MMSI's, known as the Maritime Mobile Access and Retrieval System (MARS). GMDSS DSC equipment is normally comprised of a stand alone control unit, with an alpha-numeric display screen and a keyboard on which to compose messages. 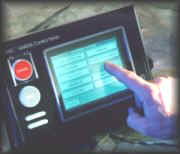 <---Typical VHF DSC controller - note display screen and keyboard. The control unit controls the actions of the DSC modem (modulator demodulator). 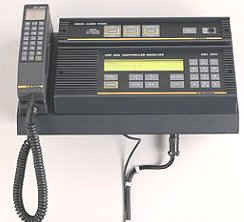 The modem is interfaced to a DSC watchkeeping receiver - this receiver is fixed tuned to either the VHF DSC channel (ch. 70), the 2 MHz DSC channel, or the HF DSC channels. HF DSC watchkeeping receivers are designed to scan the 6 MF/HF DSC channels in rapid sequence (2 seconds or less). DSC watchkeeping receivers are fitted with their own dedicated antennas. The DSC modem decodes all calls on the frequency to which the watchkeeping receiver is tuned. If calls are received addressed to all ships, or to the particular ship on which the DSC system is fitted, the DSC controller sounds an alarm, and displays the decoded information on the alpha-numeric display. The DSC modem is also connected to an associated MF/HF or VHF transceiver to allow the transmission of DSC calls. To transmit a DSC call, a GMDSS operator enters the required commands to identify the station (or stations) with which communication is desired, the priority (DISTRESS, URGENT, SAFETY or ROUTINE) and the purpose of the call. Once the call is composed, the CALL button is pressed on the DSC controller, and the information is sent to the associated transmitter for transmission. All DSC systems provide complete remote control of the associated transmitter - the selected DSC frequency information is fed to the transmitter over a serial control link from the DSC controller. The whole process is automated - the DSC system instructs the transmitter to change to the required DSC channel, the transmitter changes channel and (in the case of MF/HF systems) tunes its antenna system. The transmitter then signals a ready command to the DSC controller, which sends the information for broadcasting. The entire process takes only 3 to 5 seconds. DSC controllers are also required to be interfaced to GPS receivers for automatic updating of position and time information. This information is automatically included in distress calls. DSC controllers are also required to be equipped with a DISTRESS button, which allows the transmission of a distress call with minimum delay. The button is required to be protected by a cover, and also can only be activated after "2 separate and independent actions".